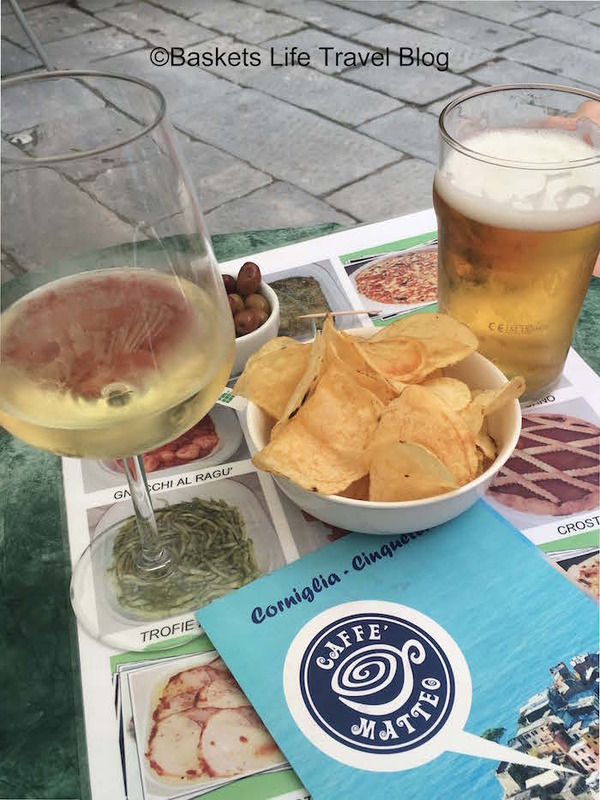 Finding what to eat and drink in Cinque Terre can be a bit overwhelming! 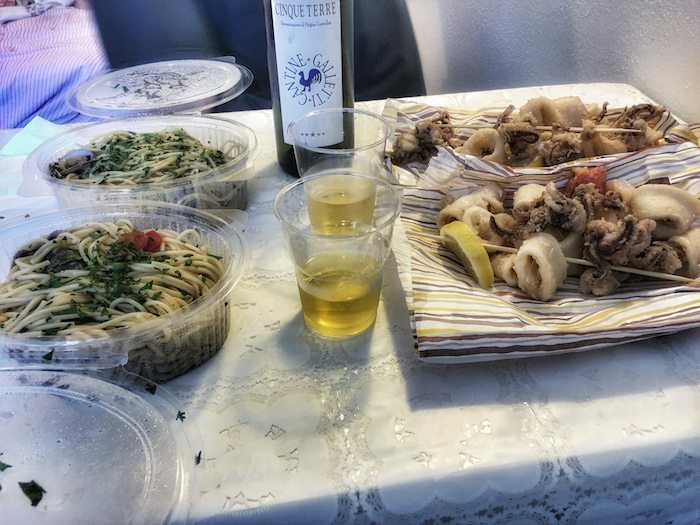 Hopefully, my list of food specialties, wine, and where to find them will give you some great ideas on the best places to eat and drink in Cinque Terre. I fell in love with Cinque Terre the minute we arrived and was ready to hit the ground running! To be honest, we had no plans for our time in the five lands… none at all, which is very unlike me. Normally, on our travel adventures, I have every sight mapped out, I know the history, have a plan, know where to stay and what to eat and drink. What is my best advice about the beautiful destination of Cinque Terre? Just go with it, enjoy the view, drink the local wine and eat the local, specialty foods. I could tell you every church, and all the history, and the giant Neptune statue, and list what you must see; I could tell you to hike all the trails and walk every inch with a map, but I’m pretty sure if you found my site you have already Googled every possible list of what to do in Cinque Terre… am I right? So, let me tell you not what to see, but how to play and enjoy your down time. Mainly what to eat and drink in Cinque Terre, while you are there. 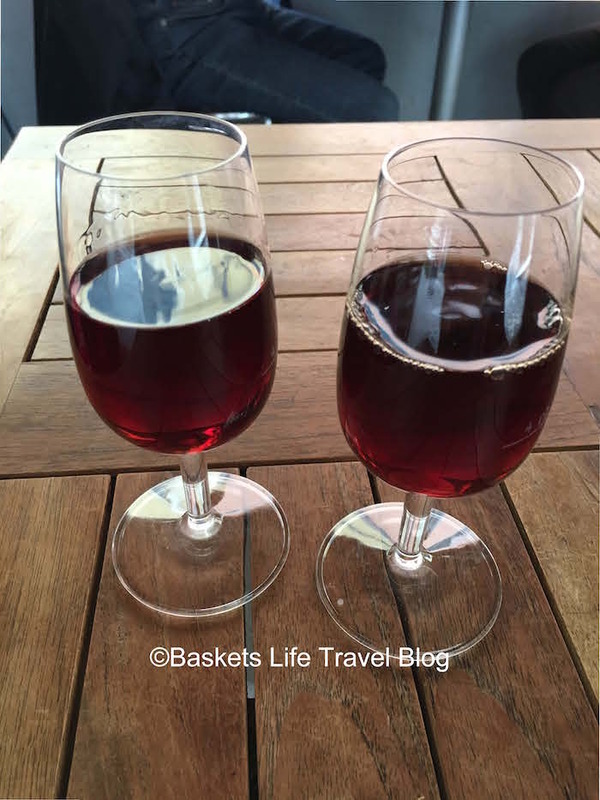 If you’re not a wine lover then you would not want to travel with me, so maybe you want to stop reading right now! Cinque Terre has its own DOC designated origin wine that only comes from the vineyards around the five villages. The wine is made from the Bosco, Albarola, and/or Vermentino grapes that are from this region. You will be hard pressed to find it when you leave Italy, so have some while you’re there! Even Wine magazine agrees the wine is great! Drink some, take a walk, enjoy the view, and drink some more. My husband, the athlete, loves to walk and walk and walk… and, well, I love to drink. So, we compromise, and if I walk wherever he wants to go I am rewarded with a big glass of grape goodness! Everyone wins! If you want to get the full experience of Cinque Terre Local food, you should take a walking food and wine tour. This way you get to taste the best local foods, and drink the local wine while learning the history behind the food and culture. Our choice for the best food tour is –> The Cinque Terre Food and Wine Walking Tour <– Compare prices here. Here is my list of places to eat and drink as you wander through the amazing destination of Cinque Terre. They are in order of making your way from RioMaggiore and stopping at every village ending in Monterossa. 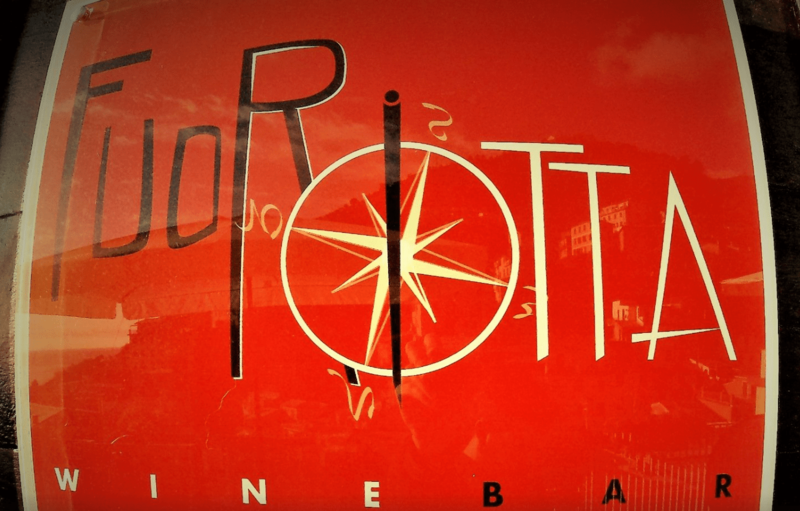 RioMaggiore – Fuom Rotaa Wine Bar – Via Telemaco Signorini 48: This little gem could be the best place in RioMaggiore. It is up above the crowds of the main street. If you are walking up to see the castle, you will pass by the wine bar. The owner’s name is David, he was born and bred in Cinque Terre, and would love to share his life story with you. Ask him for a flight of wines to sample and he will be happy to pick some out for you. Try his olives and snacks while looking out over the view. He also has great local and scrumptious food – a great place to come back for dinner one night. Corngilia and Cafe Matteo: A little hole-in-the-wall spot with tables outside but they make their own DOC Cinque Terre wine and IT IS GOOD! Have a glass, or buy a bottle to take home, but have some! Make sure you sit in their chairs – there are multiple cafes in this area and they each have their own chairs to serve their customers. Cafe Matteo has the chairs to the top left when you enter the square. I would not eat a full meal here; just have a snack and a glass of wine or local beer, which is also great if you are a beer lover. Benas had beer; I had wine. My favorite part of this place was the amazing service and the waitress who just loved to chat. She gave us all kinds of info and loved on Amber, our daughter. The locals congregate in this square, sitting on wine barrels. Oh! You have to take the train because the ferry does not stop here. Getting to the top of the Village. Once you arrive, there is a shuttle for 1.50 from just outside the train station. It will take you up to the top of the village – it is worth the money. BONUS: Stop at the Alberto Gelataria for fresh orange juice or gelato on your way out of the village. Yummy! Take it with you as you walk back down to the train station. Amber loved the ice cream! Walk the Lardarina: When you are ready to go, head back out to where the shuttle left you. Walk up the hill to your right and follow it to the stars called the Lardarina; there are 382 steps and 33 flights that take you back down to the train station. Enjoy the amazing view! And you just had wine and ice cream so you have a chance to walk it off. 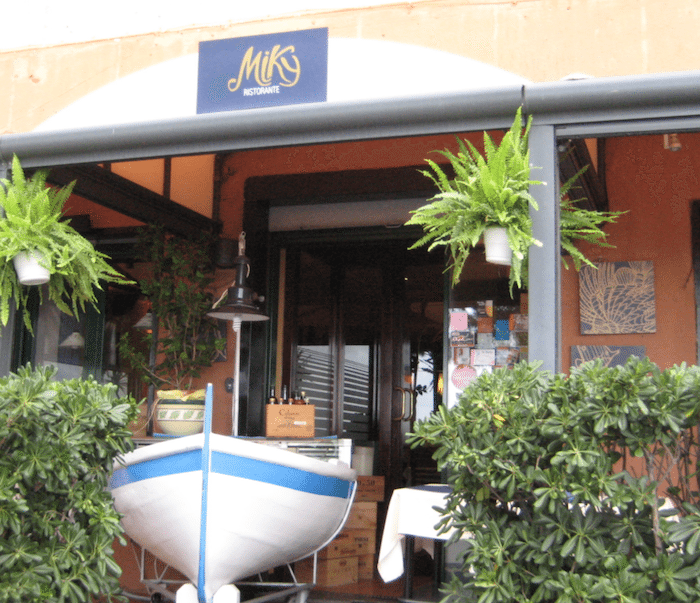 Manarola – Nessun Dorma – Localita Punta Bonfiglio: This is the coolest place to have a drink in Manarola. Follow the signs to the top of the hill. The view, the view, the view! Try to get here early to snag a table for sunset; this gem won’t stay secret for long, and they don’t take reservations. They have many fun and fruity drinks, a nice variety of wine, and gorgeous antipasto plates full of local salami, cheese, and olives. The place is family owned, and the staff is friendly and happy you are there. Have an authentic Italian Aperol Spitzer and some olives while you watch the sunset! Vernazzo – Vineria St Marta – Via Roma 44: St. Marta is a super cool wine store with tables outside. The friendly staff will help you choose from the many, many wines they have. This is off the beaten path a little bit, and up the road from the main tourist area, not near the beach, so it’s a bit calmer. Walk around the castle, over the walk way, and keep going straight up the main road until you see it – it is a small store with tables outside. Try some wines and have a snack – their pesto sauce is excellent. They have wine tasting that consists of three types of wine, red or white. 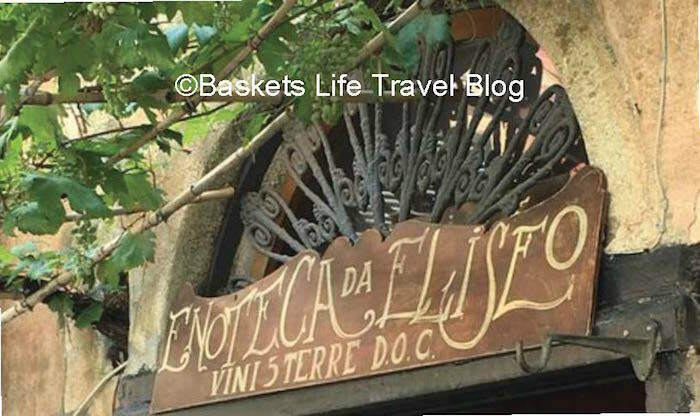 Monterossa – Enoteca da eliseo: This cute little place is owned by Eliseo and his wife, Mary. They have been in the wine business for 30 years. They are warm and friendly and want you to enjoy the wine as much as they do. The prices are fair and they have a nice selection. Try to get a seat outside and have a sip out of their monogrammed wine glasses. You won’t want to leave! Eliseo has a lot of charm and will give you as much info as you want about wine. It is a little bit hard to find; here is the address – 3 Piazza Matteotti. They are normally open until 11:30. While you are trying all the wine you can, you should try the other local specialties, too. They have some amazing food steeped in long-standing tradition, and the yum factor is amazing! If you have little ones like we do – get some takeout, set up your table back at your hotel room, and relax after you put the kids down. Where Terra Bargon, Riomagiore: Sciaccherta is the local and special dessert wine made in Cinque Terre and is the only one of its kind in the world. The color alone sets it apart with its berry-red hue and high-alcohol content. It is smooth like a liquor but sweet and fruity. You have to have a glass of this while traveling in Cinque Terre. If you want the best experience, go have a tasting and see where it is produced in Terra Bargon. They sell the authentic sciaccherta wine, offer wine tours and tastings of their product. They will also be happy to share its taste and history with you. The shop is located just off the main street in RioMaggiore. You can contact them here –> Terra Bargon, or contact Alessandra at 39 335 6997268; she will be happy to help. Eat focaccia and/or farinata bread: This is a local specialty and originated in Ligura. Foccacia is flat bread and usually has herbs added, and sometimes you can get dipping sauce with it. My suggestion is to try it with pesto sauce. Farina is made of chick pea flour and is crusty on the outside and soft on the inside; again, a wonderful specialty of the area. If you want to try both in one bite, try what the locals eat – mezzina, which is farinata stuffed inside focaccia. Oh my goodness! Delish! Where to get it? My vote is Monterossa and a small local place out of the way called Il Frantoio. You won’t see any signs or anyone trying to wave you inside. The shop is on Via Gioberti, a little bit out of the way but totally worth it. You might not have a lot of English speakers in the shop but just point at the food in the display – that will get your point across. Eat frito misto and fried anchovies: Siamo Fritti Riomagiore. First Misto is something you have to eat while in Cinque Terre.There are many frito misto places in all of the villages. Frito misto is fried seafood wrapped in a cone – the Italian version of fish and chips, and it’s good! Siamo Fritti was our favorite, the price was the best we found in the five lands, and the owner was working behind the counter and he happened to be very nice; plus, the food was fresh and hot. He also has fresh fried anchovies that are a specialty of the area, and people eat these little salty treats like french fries. There are no seats – it is strictly take away. It closes early – at 8:30 – or once he sells out of his fresh fish and seafood, so go for lunch; otherwise, he will be sold out of everything. It’s on the main street, left side, going away from the sea. You can’t miss it. Maybe you would love to learn how to cook many of these local foods, if so we recommend a cooking class in the area with locals. You even learn to make your own pasta! Oh Yum! Compare cooking lessons in Cinque Terre Here! Make a reservation if you want to eat, and make sure to confirm because they are always busy during season with foreign tourists and Italians alike. Don’t get stressed if you have to wait even with a reservation. They have fantastic fresh seafood and fish. They make their own pasta, and everything is fresh and cooked to order. It is on the pricey side, so be prepared to pay for the greatness, but it is worth it. Fresh seafood, mussels, clams, sea bass (branzino), and sea bream (orata). The service is very good, and they can recommend wine parings to go with your food. Address Via Fegina 104, 60015 Monterosso al Mare, Italy. 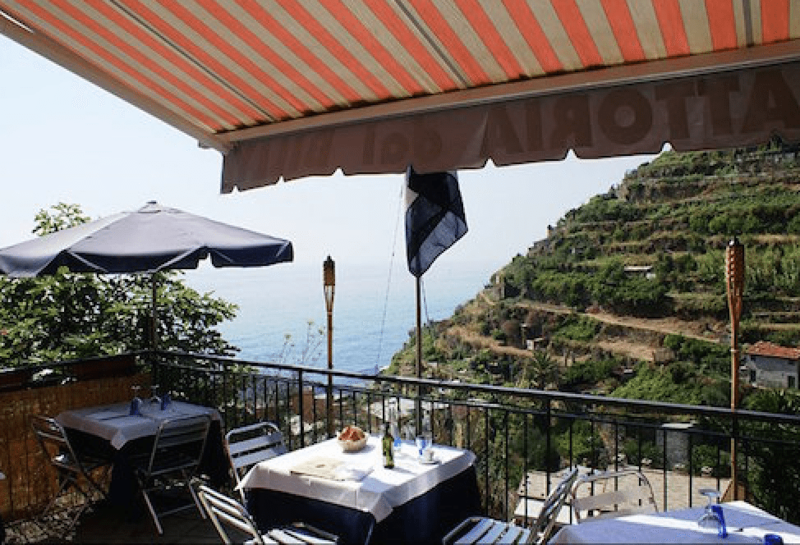 You can not miss this restaurant, as it is right at the corner on top of the fort when you arrive in Vernazza. They specialize in seafood, lobster, table-side service, and great, local wines with the best view in the village. 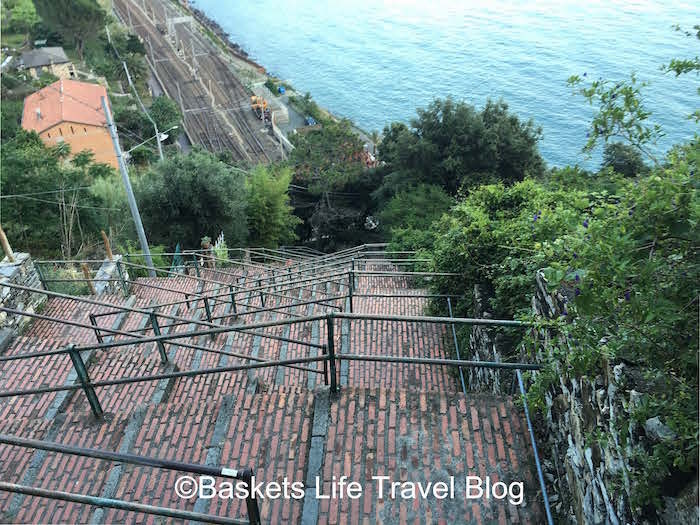 Beware – you have to climb a lot of steep stairs to get to the restaurant, so it is not for the faint of heart, but the climb is totally worth it. There is not a lot of seating so you might have to wait, even if you have a reservation (which is encouraged). Eat some squid in ink sauce and ink pasta or fresh seafood that was caught just a few hours before you arrived. You won’t be disappointed. Enjoy the view and glass of wine. Address – Via Guidoni, 42 – Vernazza, Cinque Terre. Website for reservations. This place sits in Manrola with a great view and fantastic seafood dishes. They have fabulous salted anchovies, and I would recommend the fresh pasta with pesto if you are not having fresh fish or stuffed mussels. They also have black pasta and they make some incredible deserts. They have a large menu and something to please everyone! Make a reservation to ensure you get a table. Address: Via Rollandi 122, 19017 Manarola. Website for Reservations. You know it’s good when the locals eat there. I almost don’t want to tell you about this place so it stays a secret for when I return. The food is excellent, the service is even better, and the view is to die for. It does not get much better than this one! 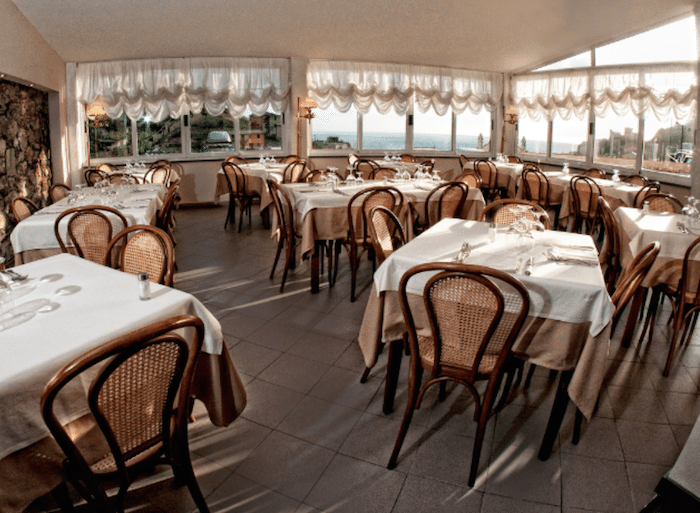 It also has the best prices of any of the seafood restaurants in all of Cinque Terre. They serve local specialties and superb risotto. They have a great wine selection and cook with all local products. If the restaurant is really busy, your service will slow down; don’t get frustrated. Just enjoy. Plus, you are in Italy – where do you have to go, anyway? Reserve your table upfront and specify if you want indoor or outdoor seating. Address: Via de’ Gaspari 282, Riomaggiore. Website for reservations. Last but not least, take the ferry from one end of Cinque Terre to the other. If you time it right, at sunset, your trip will all be worth it. The best photos are midday in the beautiful sunshine, or just before sunset! The best view of the coast line, the beautiful colored buildings, and the landscape, is from the water. The ferries run all day long during the season! You can catch them at the water front of each town, and there are ticket vendors at the docks as well. 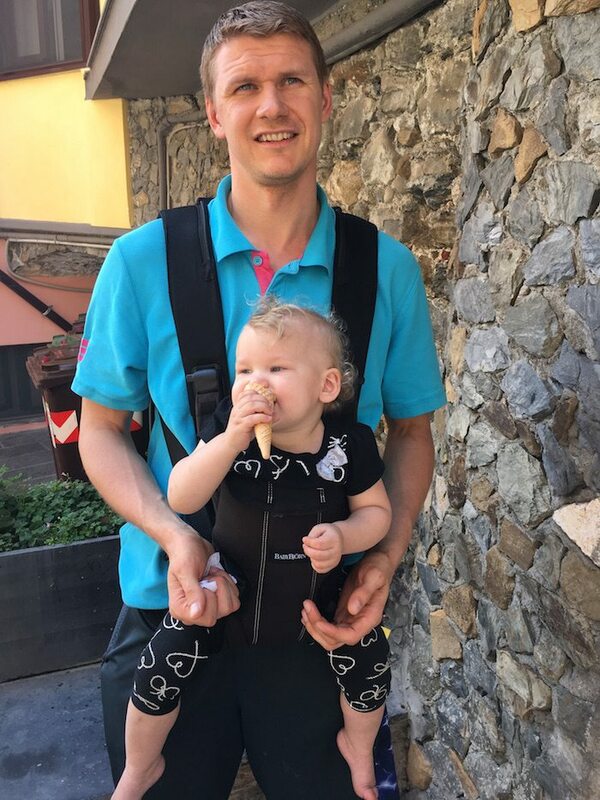 What Else Can I help you with in Cinque Terre? Parking is really difficult in the area. You either need parking with your hotel, or your best bet is to park at the La Spezia Train station. There is a parking garage with long and short term parking for 18€ per day or 8€ for a half day. This is the best price you will find and you don’t have to drive that road into Cinque Terre. The trains run all day and it is only a 7 min train ride to Riomaggiore, and 22 mins to Monterosso. You can even book your parking spot online here . To check your train schedule you can go here to GeoEuro to compare all options. Put in La Spezia Central to your destination. Place to Stay in Cinque Terre? Check out our post on all the best places to stay in Cinque Terre for families. We stayed at Banchi Hotel, it is smack dab in the middle of Riomaggiore, and without a huge walk up or down the hill to the main street. There are steep steps however, and the rooms are only big enough for 2 adults, 1 child. They do have parking. If you need a family apartment with kitchen and some space the best place is Donadelmar Apartments which are brand new, fully equipped and spacious. They have no onsite parking, but they will pick you up from the train station. You can find them both at compare prices here. If you need a car and decide to drive, to Cinque Terre or the train station and park, you can easily do that by comparing prices of car rentals here. If this is your first time in Italy and are not sure of the etiquette on eating out, please read my blog on How to Dine Out in Italy. Until next time! I hope you enjoyed our guide on what to eat and drink in Cinque Terre. In between your hikes, sights, and wandering, I hope you will take some time to enjoy the local food and wine. Do you have any great, secret places to eat and drink in Cinque Terre? I would love to hear about them! Just drop a comment below. 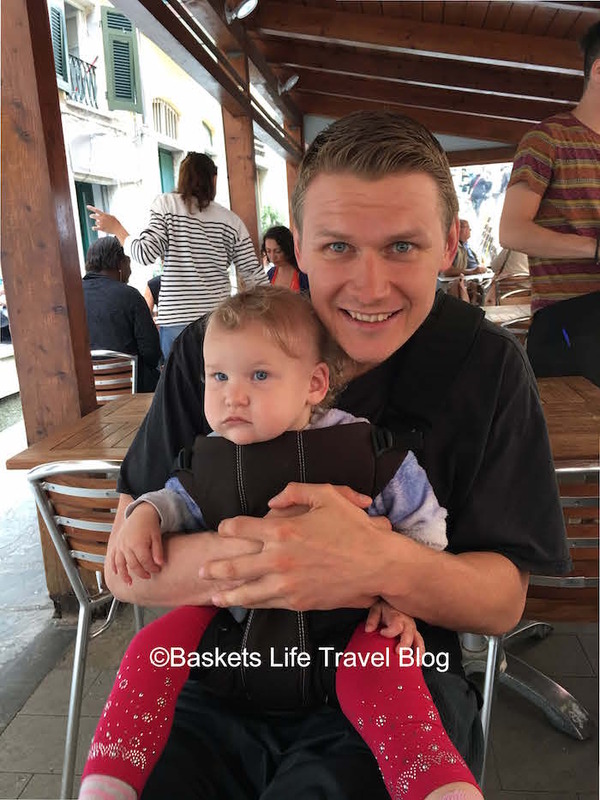 Please be advised that Baskets Life Travel is an affiliate partner of travel sites to bring you the best prices, locations, hotels, car rental and flight options. If you click on a link we could receive payment, goods, or compensation. We only promote travel we have personally used our selves, and we know you will love too. All opinions are our own. previous post	Did you know Buffalo Mozzarella Cheese is made from Italian Water Buffalo? OMG I thought CinqueTerre was just a small area of colorful homes on a drop-off to the water. Then, when I go, it will have to be at least a week! Thanks. I´ve fallen in love with Cinque Terre and I´ve never even visited. Ha! I long for the day that I´m able to enjoy all of its magicalness. Also, I´m quite the opposite. I typically just go with the flow and don´t make much of an itinerary, ever. But, then again I´m also a solo traveler. I imagine with a family a 5 a plan is definitely necessary. All the food and wines sounds so amazing. Can´t wait to visit someday. The place looks gorgeous. With the wine and colorful buildings, I'd just fall in love with Cinque Terre I guess. Btw, is there anything in Italy that won't make you fall in love with it!!! The local wine does look yummy. And I like the whole ambience and feel of cafe Matteo. Your description gives it a very friendly feel. It must have been nice to travel with three, more food for you guys right? haha. Really cool that you focused on food and wine and not the sites. Each and every place mentioned looks amazing and authentically Italian. Yum! I love they have their own DOC wine in Cinque Terre - and could easy pass a few hours/days trying every single varietal drop they had! All the time whilst eating the delicious pizza, pasta and gelato available and gazing at the amazing views. Sounds like the perfect vacation to me! oh...if I ever go there, I'm printing out your suggestions for wine bars. I've seen so many stories on this area, but none focusing on food and drink, which, come now, is most of the reason people travel in Italy. I've heard stories as well about how crowded the Cinque Terre is, how (sorry) disappointing, but with good food and wine I think any area should be fine. Thanks, and cheers to you. I love that you chose a place that is a little off the beaten path. Si glad they are know for focaccia and farinata bread. Also think that the larsarina looks amazing. Thanks for the great info. Cinque Terre seems to be such a colorful town. I will love to trek between these villages and for sure a ferry ride from one end to other. Your pictures are beautiful esp the one with bridges and houses. Italy is great for food! I am a big fan of fresh italian cuisine and its excuisite taste with simple and few ingredients! thanks for sharing! Oh I love Italian food and wine! I want to do all of these things, especially drink the Sciaccherta and eat the frito misto. And I like the deal you have with your husband about getting wine if you go for a walk with him. Sounds fair to me! We would love to hike between the villages so this list is being saved for safe keeping! I am hoping to make it there in the near future. Especially since they are limiting tourists either already or soon. Thanks for sharing our tips. I would love to visit the Cinque Terre! I love wine and I would definitely go for a focaccia! Anchovies aren't my thing, but there are so many options for food there that I wouldn't be disappointed! Great tips. How amazing is the Cinque Terre. I fell in love with it as soon as I arrived and wished I could have stayed here forever. I'd be a good travelling buddy with you - love my wine, expecially in Europe where we find it all so inexpensive. Really enjoyed reading this. Oh I would love to have your knack for planning trips just for a day or so - going by the seat of my pants is always how I roll. 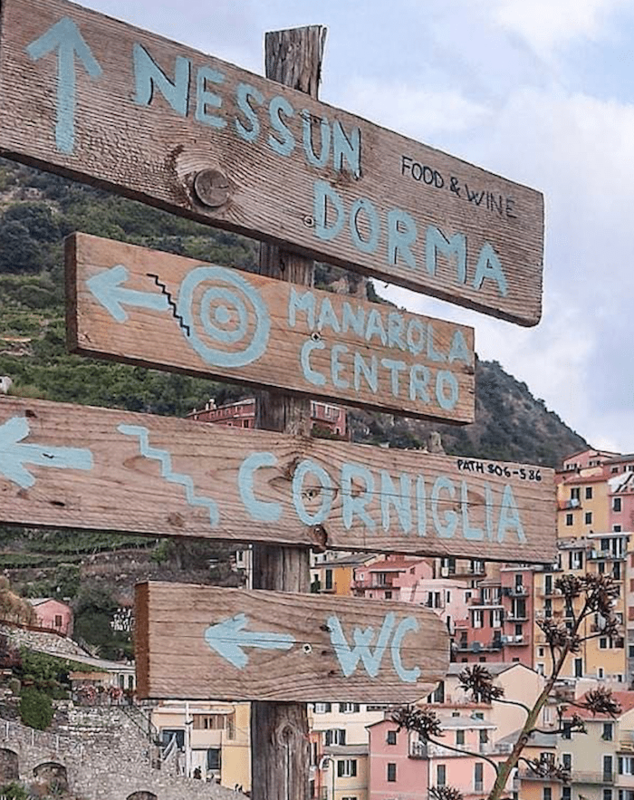 I'm glad going with the flow turned out to be the travel preference for beautiful Cinque Terre :) I'm eyeing all of those glasses of wine with such stunning backdrops! Gimme! I loved the fresh seafood and focaccia in this area. Also you can't leave without a gelato! Cinque Terre really is a little piece of heaven isnt it. We spend almost a week based in Vernazza early one spring and even though half of the town was shut down during the week the restaurants would take turns to open each night so there was always somewhere to go. We never had a bad meal. Restaurante Belfort is fantastic and not just for the view. As a fellow wino, I fully support your choices to punctuate walks with wine! I haven't made it to Cinque Terra yet, but after reading this I just might need to take a little wine and dine trip! I did not make it to cinque terre but the food I had during my time in Italy was amazing. My favorite was anything with truffles. Cinque Terre is definitely on my list for my next trip so will keep your recommendations in mind. Thanks for sharing on #TheWeeklyPostcard. 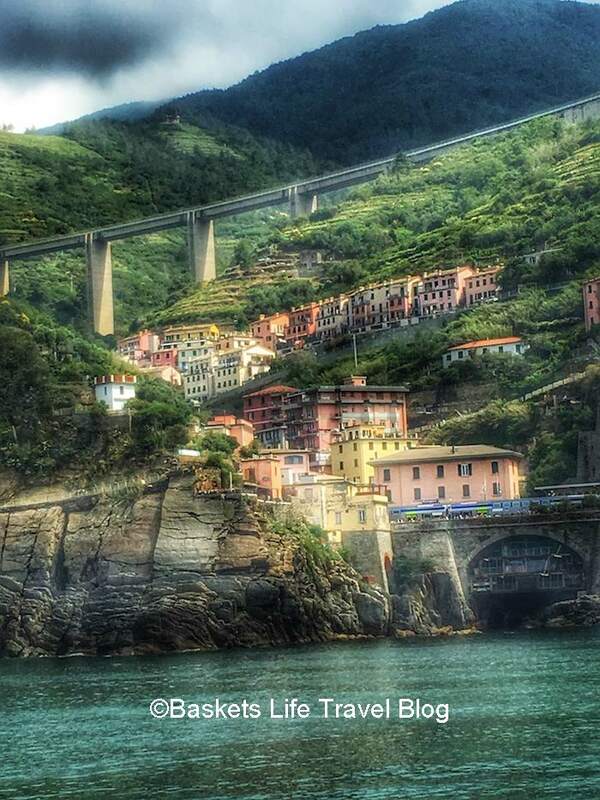 I just love this real guide to eat and drink in Cinque Terre Italy. I'm sure if we travel to this awesome location I would bookmark this post for reading step by step, because is really useful. Ah, I ate at Nessun Dorma and Belforte, both fantastic! We booked a couple of days in advance for Belforte to get one of the best tables up in the tower itself - definitely worth the wait! I visited Cinque Terre a few years ago and it was definitely one of my favorite places in Italy!! I actually took the ferry from one end to the other and luckily got to see the beautiful sunset!! Great tips there! I still haven't made it to Cinqueterre, but I'm hoping to go there this year. I'm definitely bookmarking your post. OK, now I'm properly properly hungry. I love all the recommendations for cafes, restaurants, little wine shops that do tastings... all look so wonderful. 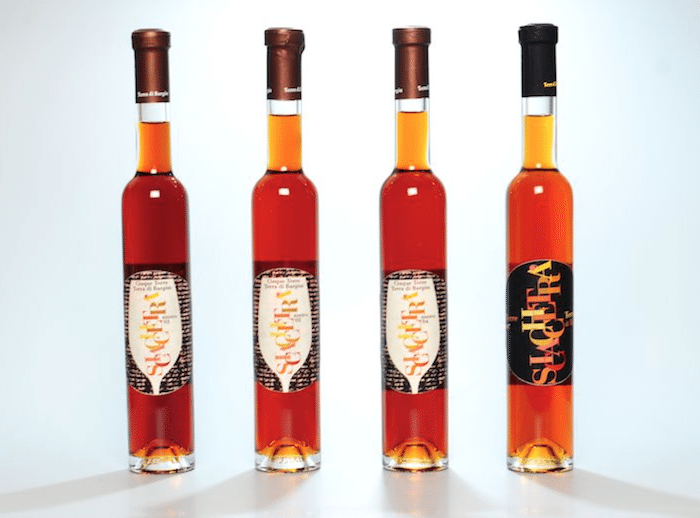 I'm not a big wine drinker, though my husband is, but oh my gosh I love dessert wine so I perked up even more when I read about Sciaccherta, I'd not heard of that before and it's one I now really want to try! Italy has so much diversity when it comes to food and wine! That's why it's always a great idea to go local: you will make sure to drink and eat the best stuff! I'm glad you had fun here! Cinque Terra is magical, so much more than one even expects it to be. Foccacia and basil...I can live on those! 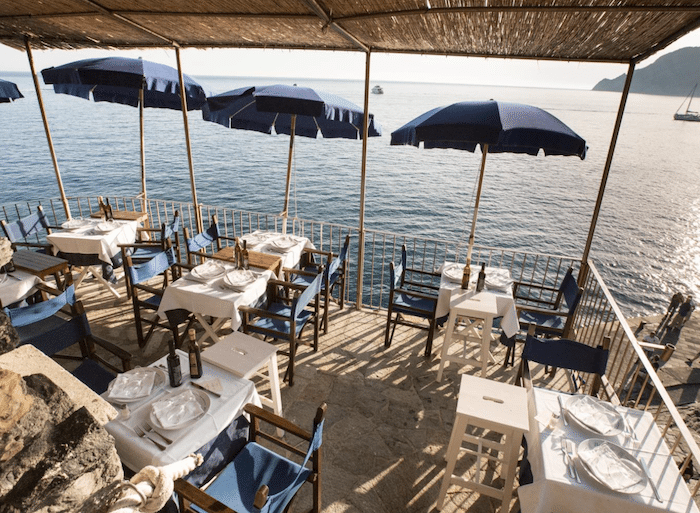 I could perfectly imagine myself seating at the Resturante Belfort in Vernazza, eating seafood, having a glass of red wine and listening a 'canzone'. Beautiful scenery, delicious food, tasty wine and great company - that's 'La vita e bella' ! Thanks for sharing great tips, bookmarking them!